Twenty-six years ago, a few friends wanted to make a difference by providing healthy meals to other close friends affected by AIDS. Today, their idea has grown into Open Hand, a non-profit organization which manufactures and delivers 4,500 freshly prepared meals a day to seniors and people managing all types of chronic disease. In addition, the organization also provides nutrition counseling for its clients. Based in Atlanta, Open Hand has also established a second product line, Good Measure Meals™, which offers nutritionally-sound meal plans to the paying public, in which 100 percent of the proceeds go to supporting the charitable nutrition services offered by Open Hand. Over the past 10 years, the organization has grown from offering 10 types of meals to 30 different meal options. Between the two brands, they cook an average of 20 recipes a day, with each recipe consisting of 800 to 1,000 pounds of food. As Open Hand grew rapidly, the organization moved several times to support that growth and in doing so was never able to establish long-term, effective processes. It was during this time that the Georgia Center for Nonprofits suggested that Anderson contact the Georgia Manufacturing Extension Partnership (GaMEP) at Georgia Tech. Bill Ritsch, North Metro Atlanta region manager, and Kelley Hundt, project manager, with the GaMEP met with Anderson and Matt Pieper, executive director of Open Hand, to discuss training for their front line supervisors. Ritsch and Hundt gathered the Open Hand supervisors and conducted a value stream mapping exercise. Through discussing lean techniques and utilizing a paper airplane simulation, they were able to provide a visual of how an inefficient process can be modified slightly to make immediate improvements. Next, Ritsch and Hundt took the simulation training to the floor, where they walked through the process of how product is received, stored, prepared, cooked, stored again, packaged, and delivered. Through this exercise, it was determined that there were space constraints in the kitchen, supplies were in different stations than needed, and there was no system for organizing prepared food in the storage area, creating missing items. The team decided the first issue to address was the prepared food cooler, as having to recook misplaced food was costly. The culinary team would place prepared food in a Lexan container, and then on a rolling rack, which would be moved into the cooler. 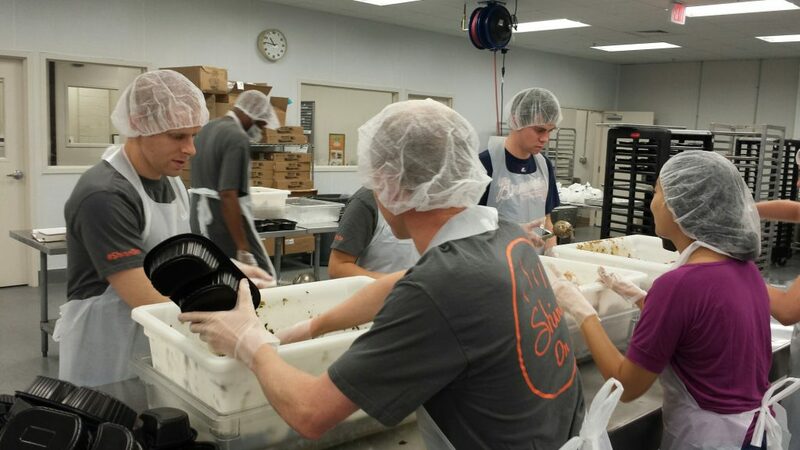 The packing team would gather the individual prepared foods from the cooler to assemble 4500 meals a day. With the rolling racks being placed in no particular order, at times the packing team had difficulty finding a food item, causing the culinary team to have to recook that item. In collaboration, the two groups came up with a solution to organize the racks stored in the cooler by production day, create signage for each rack, and then color code food by type of meal and brand. This solution reduced the time it took to search the cooler from 45 minutes to 1 minute and also eliminated 100 percent of the waste the team was experiencing by having to replace lost food. For Open Hand, the timing couldn’t have been better. The organization was about to expand its production facility into another warehouse space behind their current facility, going from 10,000 to 27,000 square feet. By using what they learned, they were able to incorporate lean techniques into the layout of the new facility. To cut down on wasteful movement, they shifted the receiving items nearer to dry storage, and moved the cooler closer to the packing area, where the finished goods are assembled. They set-up a system to make supplies accessible to every station. They also applied the solutions from the prepared food cooler to other coolers and dry storage areas within their facility. In addition to solving the problems identified by the Value Stream Map, Anderson and Pieper also wanted to reduce delivery errors. By creating packing lanes around the different meal types and putting quality checks in place at each line before the meals are bagged, customers receiving incorrect orders have drastically decreased from approximately 24 a month to almost zero. For Anderson, Pieper, and the rest of the management team, it was important that these changes become engrained in the culture and that improvements continue to be made. The team has made lean terminology part of their daily conversation. Additionally, the management team has embedded lean culture into job descriptions, and has also made it part of their recognition program and a requirement for career advancement within the organization. By making a deliberate effort to incorporate lean thinking into their organization, Open Hand has become better stewards of their funding. As a next step, Open Hand continues to work with the GaMEP to help develop a strategy to coordinate and collaborate more effectively with other non-profit meal providers. Volunteers prepare meals at Open Hand. 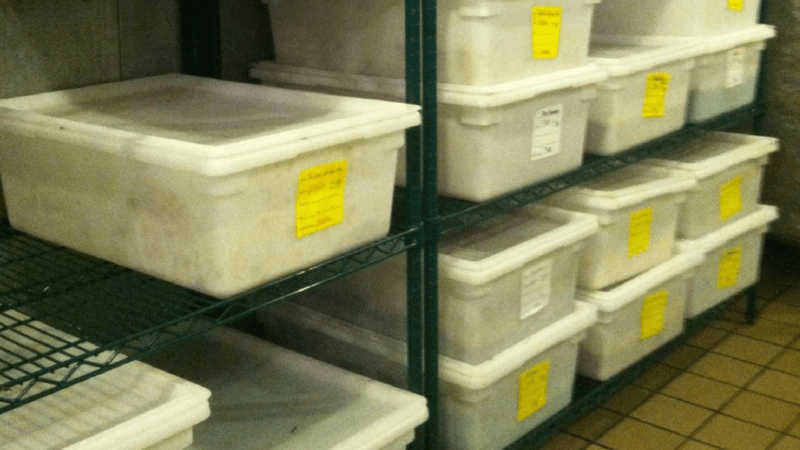 New food containers organization system reduces food waste and increases efficiency. Download the Open Hand Success Story Flyer.